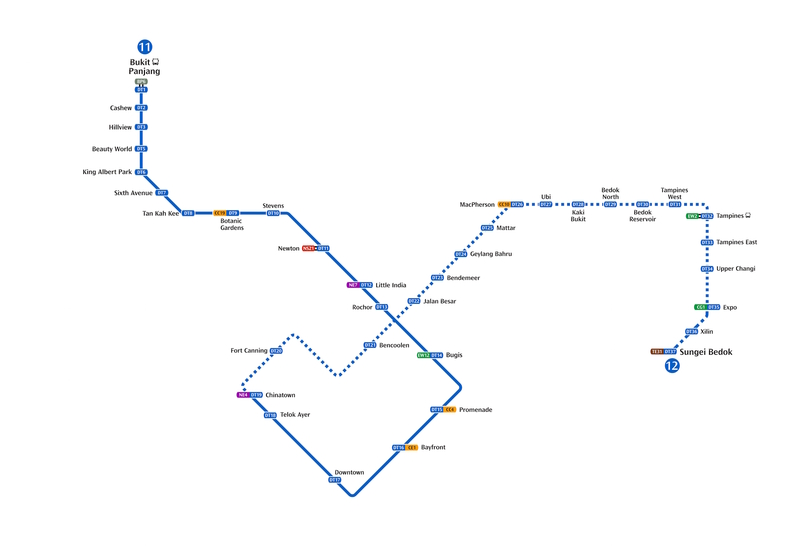 The Downtown Line (DTL) is an underground, driverless, medium-capacity MRT line that connects the North-Western and Central-Eastern regions to the new downtown. 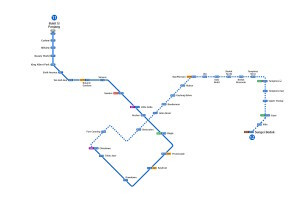 When fully opened, the line will be about 44 km long with 36 stations, running from Bukit Panjang (DT1) to Sungei Bedok (DT37) via Downtown (DT17). 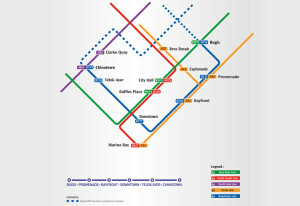 Currently, only 34 stations, from Bukit Panjang (DT1) to Expo (DT35), are open for passenger service. Hume Station (reserved station code DT4) is a shell station with only structural provisions, which will be refitted and opened around 2025. A future extension, the Downtown Line Stage 3e, will extend the line from its present Expo terminus to Sungei Bedok (DT37) via Xilin (DT36) and will open in 2024. It will link up with the Thomson-East Coast Line and the future East Coast Integrated Depot which will accommodate East West Line, Thomson-East Coast Line and Downtown Line trains on different levels. 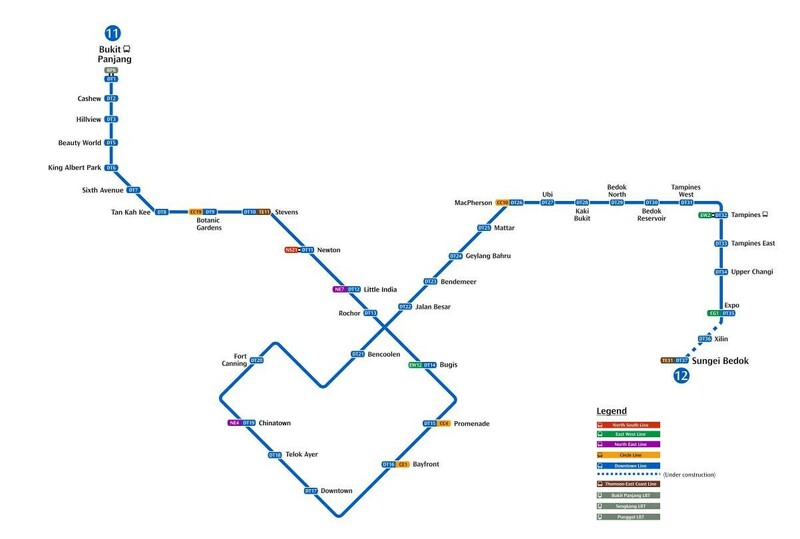 The line is fully underground (with the exception of Gali Batu Depot at surface level), and is the longest driverless MRT line in Singapore. It uses the Bombardier MOVIA C951 rolling stock, operating in a three-car formation and built by Changchun Bombardier Railway Vehicles. A total of 92 trainsets were procured. 2017 (21 Oct): Opening of Downtown Line Stage 3, with trains running between Bukit Panjang and Expo stations. 2007 (27 Apr): Then-Minister for Transport Raymond Lim outlined the new DTL and its three stages of construction. 2009 (03 Jul): Groundbreaking began on the DTL 2 at the Beauty World station. The 16.6 km length stretches to the northwest from the city centre and across the Bukit Timah corridor to end at Bukit Panjang. It has 12 stations. 2011 (28 Nov): Groundbreaking began on the DTL 3 at the Expo station. 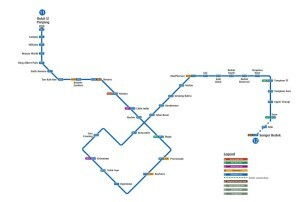 The DTL 3, which spans 21 km eastwards from the city centre to the Singapore Expo, comprises 16 stations. 2013 (19 Jun): One of the major contractors for the DTL 2, Alpine Bau, declared insolvency, threatening a considerable delay of at least six months to the completion of the train line. The Downtown Line Stage 1 between Promenade and Chinatown stations was announced on 14 June 2005, and was intended to be a 3.4-kilometre Downtown Extension of the Circle Line. 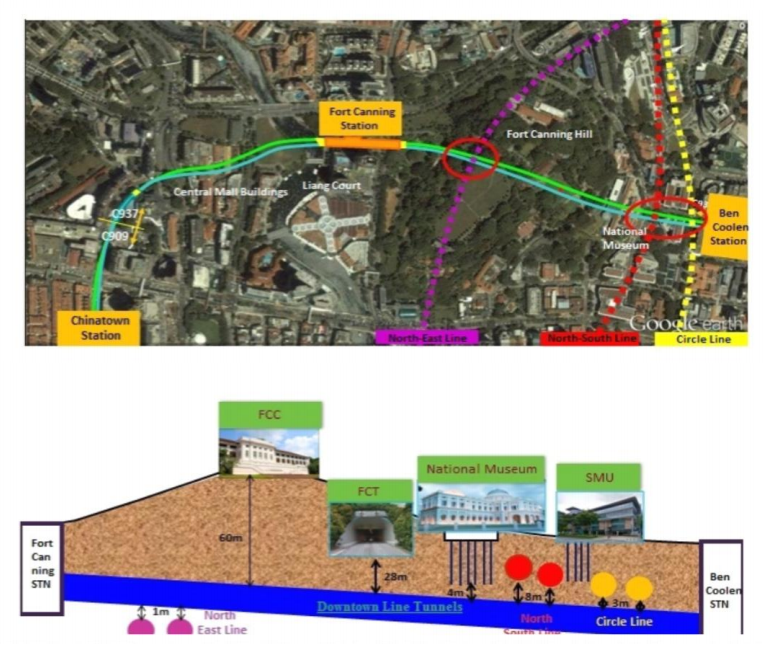 The Nicoll Highway accident in 2004 was to influence the merging of the proposed Bukit Timah Line with the planned Downtown Extension as altered blueprints rendered Nicoll Highway station unsuitable for an interchange with the Bukit Timah Line. As such, the line continued north of Promenade and curved towards Bugis station instead, incorporating the Bukit Timah Line to form a new rail line, the Downtown Line. Construction work for the 4.3-kilometre Downtown Line Stage 1 started on 12 February 2008 and consisted of six stations from Bugis to Chinatown. It commenced revenue service on 22nd December 2013, which brought about greater connectivity to the Central areas, with enhanced rail connections to the East West Line and North East Line at both terminating stations, as well as the Circle Line at Promenade and Bayfront. 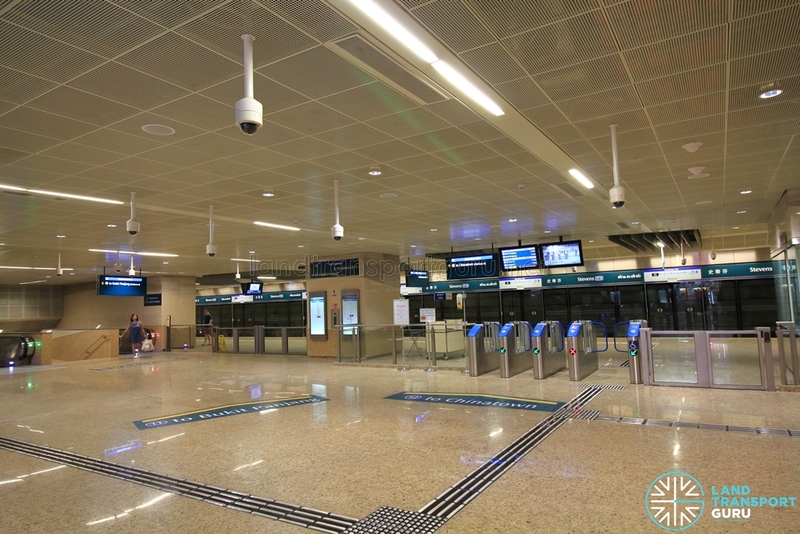 As Stage 1 was disconnected from the Downtown Line’s main depot at Gali Batu, a Temporary Maintenance Facility at Marina Bay was used to provide for low-level maintenance works prior to the opening of Downtown Line Stage 2. In the meantime, trains used the Circle Line‘s Kim Chuan Depot for the launching of trains and major maintenance works. The temporary maintenance facility was built as part of the Circle Line Extension and is now used for stabling trains. Originally planned as the Bukit Timah Line, the 16.6-kilometre Downtown Line Stage 2 tunnelled underneath the Bukit Timah corridor, adding 12 stations from Bukit Panjang to Rochor and linking up with Stage 1 at Bugis. Gali Batu Depot was concurrently built north of Bukit Panjang to provide maintenance and stabling facilities for Downtown Line rolling stock. Stage 2 commenced revenue operations on 27 December 2015, with trains running the full stretch of track from Bukit Panjang to Chinatown, interchanging with the Circle, North South and North East Lines at Botanic Gardens, Newton and Little India respectively. With the Gali Batu Depot operational, the Downtown Line’s Operations Control Centre was moved from Kim Chuan Depot to Gali Batu Depot. Construction work on Stage 2 was marred by the insolvency of a major contractor, Alpine Bau, delaying progress by months and pushing the opening date to 2016. Expedited construction work managed to bring the Downtown Line back on track, which opened in 2015 as planned. 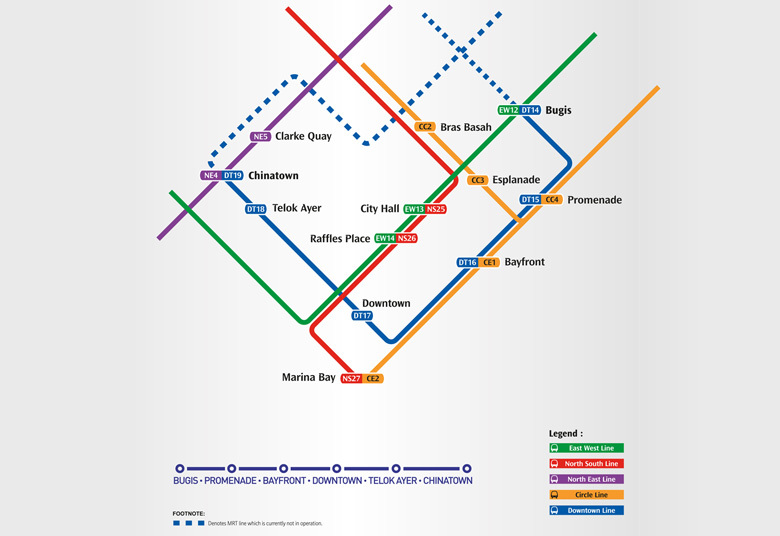 The Downtown Line Stage 3 follows an early version of the Eastern Region Line proposed in 2001 that runs from Chinatown to Expo with 16 stations. The 21-kilometre section will include branch tracks leading to Kim Chuan Depot, which is concurrently undergoing large-scale expansion works to accommodate more Circle Line trains as well as Downtown Line trains. Stage 3 commenced revenue operations on 21 October 2017, with trains running the full stretch of track from Bukit Panjang to Expo, interchanging with the Circle Line at MacPherson, and the East West Line twice at Tampines and Expo. With Kim Chuan Depot directly accessible, trains are able to be stabled at Gali Batu Depot. The Downtown Line Stage 3 Extension was announced on 15 August 2014. Due in 2024, Xilin and Sungei Bedok MRT Station will be added to the Downtown Line, with Sungei Bedok being an interchange station with the Thomson-East Coast Line. It will add an additional 2.2 km to the line. The East Coast Integrated Depot (ECID) will further expand maintenance and stabling facilities for Downtown Line rolling stock. Being built on the site of the East West Line’s Changi Depot, ECID will be a stacked three-tier train depot for the East West Line, Thomson-East Coast Line and Downtown Line. Originally built as a shell station with only structural provisions, Hume station is slated to open around Year 2025, as announced during the Committee of Supply Debate 2019. Bombardier MOVIA C951 trainsets form the Downtown Line rolling stock, operating in a three-car formation. A total of 92 trainsets were ordered, and are stabled at Gali Batu Depot. They are built in China by Changchun Bombardier Railway Vehicles, a joint venture between Bombardier Transportation and CNR Changchun. The Downtown Line tunnel between Fort Canning and Bencoolen MRT stations on the upcoming Downtown Line 3 was recognised by the Institution of Engineers Singapore (IES) as one of the top 50 engineering achievements with the greatest impact on Singapore since 1965. 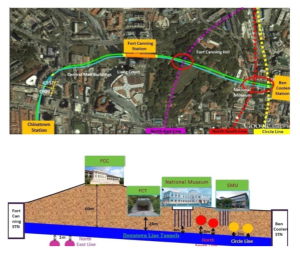 Linking the Fort Canning and Bencoolen MRT stations, LTA engineers had to build tunnels just 1m above the existing North East Line (NEL) tunnel – the closest two lines have run on Singapore’s rail network. Built over nine months between 2013 and 2014, they also cross below the North South Line and Circle Line tunnels, at 8m and 3m respectively. The LTA garnered 11 awards, the most by any agency. The winners were 28 public sector projects and 22 private sector projects. Fort Canning Station and tunnels built as part of the Downtown Line 3 also won the “Tunnelling Project of The Year” award at the 2nd International Tunnelling and Underground Space Association (ITA) held on 11 November 2016. Singapore Concrete Institute’s Excellence Awards was also awarded for the difficult construction of Little India and Rochor MRT stations as different ground conditions had to be overcome ane, as well as the realignment of Rochor Canal and construction of the North South Expressway tunnels above the stations and railway tracks.